I obviously don’t post to this blog often, so please follow me on Facebook for updates on photography, conventions, gaming and other assorted geekery. I previously used Blogger for our family blog, but they abandoned FTP support, so I had to abandon them and switch to WordPress. Hopefully everything converted over correctly and all the old links still work. Some of the formatting on old posts may not look so pretty though. 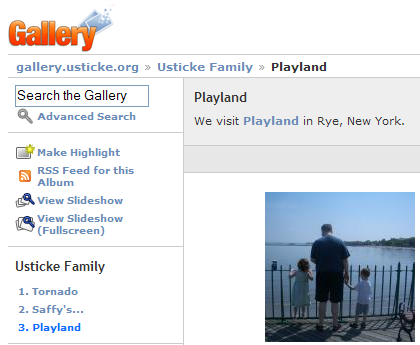 We added a new family image gallery at gallery.usticke.org. Take a gander at what www.usticke.org looked like 7 years ago. The Internet Archive Wayback Machine is a great resource to see how web sites looked in the past. After a year and a half of being lazy, I made a couple changes to our family web site. Liam finally gets his real name on the page instead of “new baby.” Now I just need to update his picture, which is currently an ultrasound. I added my father’s obituary to his page. Maybe it’s ironic that the last story on his page was about his dog Minnie dying in his arms. You are currently browsing the archives for the Web Site category.